Home Unlabelled TCAA spends almost 4bn/- on surveillance; resumes sponsorship for the training of pilots. TCAA spends almost 4bn/- on surveillance; resumes sponsorship for the training of pilots. TANZANIA Civil Aviation Authority (TCAA) will procure modern satellite surveillance equipment at 3.8 bn/- in a move to boost aviation safety. According to TCAA Information Officer, Ms Bestina Magutu, the project involves the installation of the Automated Data Surveillance (ADS-B) worth Euro 959,490,000 and Aeronautical Message Handling System (AMHS) worth Euro 621,345,256. Once the project is complete, Tanzania will be among the few African countries using this new technology. Processes to implement the project will commence any time from now, with installation to be completed by early next year. “TCAA has made this move in line with changes in technology in the aviation sector and to counter insecurity in air travel,” said Ms Magutu. She said, once complete, the ADS-B surveillance system will enable ‘flight directors’ follow up on aeroplanes passing over the airspace in the eastern part of the country including the Indian Ocean. 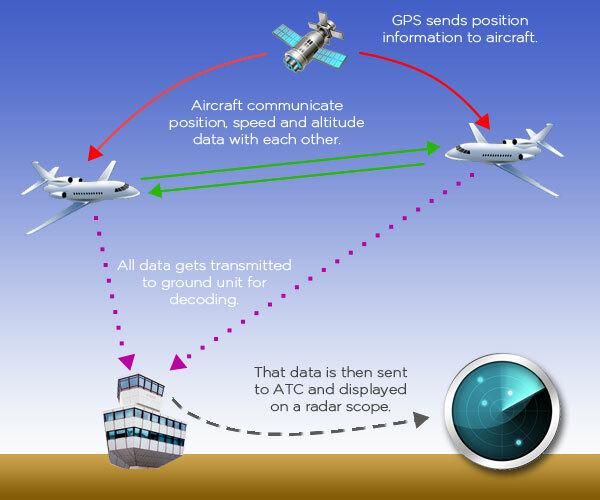 Demonstration of how ADS-B works. A German company, COMSOFT, won the tender to provide the equipment. Meanwhile, in order to build capacity in the civil aviation sector in the country, government through TCAA has resumed sponsorship for the training of pilots. According to Ms Magutu, through the fund, five students will get the opportunity to study in South Africa at 43rd Air school for 14 months. Cost per student is over $62,000. She said over $200,000 has been collected to run the Fund. The TCAA Training Fund was established pursuant to section 3 (1) of the Civil Aviation (Contribution and Administration of the Training Fund) Regulations, 2008. The main purpose of the fund among others is to train Tanzanians in aviation specialities such as Pilots. Thank you for visiting this blog. For more information kindly write to us via aviationtz@gmail.com and we will do our best to provide you with relevant information. I am very much interested in getting some equipment set up in Dar-es-Salaam for tracking aircraft which have ADS-B transponders installed. The site/app I use is flightradar24.com, and with this I can view flights in real time all around the world. It's a shame that we do not have the equipment installed in TZ. On a daily basis, you can spot KLM flights (for example) coming in from Kenya into TZ, but as soon as they pass Arusha, they disappear from the screen. Kenya has it already. Perhaps the TCAA could consider procuring the antenna ?